FUGITIVE: Escaped out the back door of his plush Rio de Janeiro hotel Thursday to avoid arrest on charges of illegally selling tickets. RIO DE JANEIRO: An executive from the World Cup's hospitality services firm escaped out the back door of his plush Rio de Janeiro hotel Thursday to avoid arrest on charges of illegally selling tickets, authorities said. 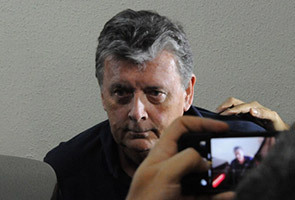 Police launched a manhunt for Raymond Whelan, a British director of FIFA partner company Match Services, accusing him of fleeing the beachfront Copacabana Palace Hotel after a judge ordered him and 10 other suspects to be held in detention. "The Englishman fled through the hotel's back door and is considered a fugitive," Rio police said in a statement, just three days before Sunday's Germany-Argentina final at the Maracana Stadium. "We saw him in (security) footage leaving in a hurry," Fabio Barucke, the case's lead investigator, told reporters, adding that Whelan had fled an hour before police arrived. Whelan, who denies the charges, was initially arrested at the same hotel on Monday but was granted preventive release the next day. His passport was seized by the authorities, but police fear he may have acquired another one from the British consulate. Police filed charges against him and 11 others on Wednesday and submitted the case to prosecutors, who requested an arrest warrant against all except one who was cooperating with investigators. Prosecutors said the 12 suspects face charges of organized crime, illegal ticket sales, corruption, money laundering and tax fraud. Ten of them are in jail, except for Whelan and the suspect who is cooperating. The Briton's lawyer, Fernando Fernandes, said he would appeal the detention order, branding it illegal, according to the G1 news website. Brazilian media have published leaked phone calls between Whelan and one of the chief suspects in the case, French-Algerian Mohamadou Lamine Fofana, discussing hospitality packages for games including Sunday's final. But Match Services has defended Whelan, saying he was innocent and that there was nothing illegal about the conversations. The Zurich-based company says Whelan was discussing the sale of 24 hospitality packages at the correct price, though he rounded up the figure to $25,000 from $24,750 per package, and that the deal was never concluded. Match Services said Wednesday that Whelan would voluntarily relinquish his World Cup accreditation but that he had not committed any wrongdoing. Prior to the news of Whelan's sudden disappearance, the executive chairman of Match Services and its sister company Match Hospitality issued a statement criticizing Rio police. "Those responsible for the investigation from the 18th Precinct of the Civil Police of Rio de Janeiro are not experts in FIFA World Cup ticketing or hospitality," chairman Jaime Byrom said in the statement. "Notwithstanding our belief that the action taken against Mr Whelan was illegal and baseless, Match Services and I personally remain totally committed to assist the authorities from the 18th Precinct or any other jurisdiction in FIFA's fight against illegal ticket sales." Byrom said cooperation with the authorities had led to "a number of successful arrests of actual touts." It is the latest scandal to hit FIFA, which is already battling claims that officials from football's governing body accepted bribes in the decision to award the 2022 World Cup to Qatar. Brazilian investigators believe Whelan gave VIP tickets to Fofana that were originally meant for non-governmental organizations, sponsors and families of players. Fofana sold them illegally with the help of travel agencies and high contacts in the football world, investigators say. Some 1,000 tickets were sold per game for around 1,000 euros ($1,360).